The DTHF offers exciting opportunities to those who have an interest in research, health or the general well-being of our people. We are a diverse team dedicated to the values of passion, innovation, progress, respect integrity and excellence. Vacant positions are posted below. Internships are by invitation only. We regret that we are not currently recruiting volunteers. How much notice must you serve with your current employer? Are you a South African Citizen? And do you have a valid work permit? Have you ever been convicted of a criminal offence or been dismissed from employment? If your profession or occupation requires professional registration, provide date and particulars of current registration. Please upload your updated CV here. Your CV should include Language Proficiency, Qualifications, Work Experience and References. © 2019 Desmond Tutu HIV Foundation. All Rights Reserved. Digital Project Management by Lightspeed Digital Media. Professor Robin Wood has had a distinguished career in medicine, both within South Africa and further afield. He is currently the Emeritus Professor of Medicine at the University of Cape Town and director of the Desmond Tutu HIV Centre at the Institute of Infectious Disease and Molecular Medicine. His first foot on the ladder was as student medical officer at a hospital in Peru, followed by stints in the United Kingdom and later, Zambia. In 1990 he took up a Clinical Fellowship at Stanford University. He subsequently served at the New Somerset Hospital in Cape Town where he became Principal Specialist and Head of Department of Medicine. It was in this setting that he confronted the HIV epidemic leading to the establishment in 2004 of the Desmond Tutu HIV Centre within the Institute for Infectious Disease and Molecular Medicine at the University of Cape Town. He has A-rated academic status and has influenced health policies within South Africa and abroad. A prolific writer, he has published numerous research papers, articles and several books and is the recipient of a number of prestigious awards. Charles Abrahams practices as a qualified attorney-at-law with specialist experience in business and human rights law, sovereign debt, complex class action litigation, public interest and human rights law, and competition law. He is a senior partner at Abrahams Kiewitz Incorporated. He frequently participates in and is often invited to contribute to domestic and international conferences and seminars. In particular, he has participated as an expert consultant in the mandates of Professor John Ruggie, then Special Representative of the United Nations (UN) Secretary General for Business and Human Rights that led to the adoption by the United Nations Human Rights Council of the UN Guiding Principles on Business and Human Rights. He is currently a consultant for the UN, drafting the commentary on the Guiding Principles of Foreign Debt and Human Rights. Among other accolades and honours, he was Cape Law Society Human Rights Attorney of the Year, 2012. Marilet Sienaert is the Executive Director, Research UCT and represents the interests of the University of Cape Town on the DTHF board. As a member of the executive layer of UCT’s leadership and management team, she is responsible for the effective functioning and continuous improvement of the university’s professional staff, structures and processes to support research and postgraduate training. She is committed to fostering an enabling environment for research and contributing to the growth and development of the next generation of academics for Africa. Mpho Ndebele is a retired professional social worker who has served on various boards, including the Environmental Development Agency, the National Business Initiative, Black Sash, Impumelelo Innovations Awards, Brimstone Investments and Siphumelele Investments. She served as the first Executive Director of the Social Change Assistance Trust, an independent fundraising and grantmaking development agency. In 2010 she was appointed the first lay-Canon in the Diocese of Cape Town and the first woman and lay-person to be selected as Chancellor of St George’s Cathedral. Eldest daughter of Archbishop Emeritus Desmond and Mrs Leah Tutu, Thandeka is deeply concerned about public health. She has a Masters degree in Public Health from Emory University, Atlanta, USA. She has served as Research Project Coordinator, Rollings School of Public Health, Emory University; Director, Africa Projects University of California; and Programme Manager, Perinatal HIV Research Unit, Soweto. Currently, Thandeka is CEO of Tutudesk – an international organisation based in Johannesburg that promotes a simple plastic table that is changing the lives of learners in under-resourced countries around the world, including South Africa. Peter Grant joined the University of Cape Town Finance Department in 1983. In 1990 he became the second most senior person within the department until his retirement in 2015. He also took on the responsibilities of acting-Director Finance from time to time. 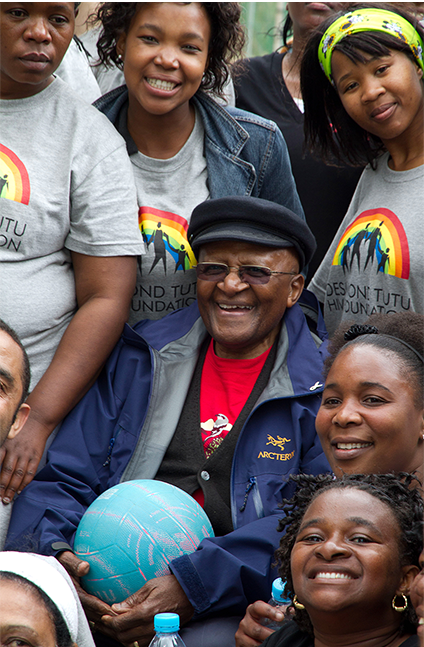 The Desmond Tutu HIV Foundation has benefitted greatly from his financial expertise. Professor Linda-Gail Bekker is the deputy director of the Desmond Tutu HIV Centre a research centre within the Institute of Infectious Disease and Molecular Medicine at the University of Cape Town. She is also the chief operating officer of the Desmond Tutu HIV Foundation and immediate past president of the International AIDS Society. She has had a distinguished career as a professor of medicine and is a principal investigator of numerous groundbreaking studies in the field of HIV and TB. Zohra Ebrahim holds an HDE degree from the University of Cape Town. After two years of teaching, she rose to become the national civic coordinator of the United Democratic Front. She subsequently became the first black female President of the South African Institute of People Management. Zohra’s leadership at company and organisational level is rooted in years of community involvement and institution building. She has a profile that few women in South Africa have attained in the community, business, and political fields. Among her awards are the Lebone Women Achievers 1997, and she was elected as one of the Global Leaders of Tomorrow by the World Economic Forum in 1998. Her extensive knowledge, skills and experience across both the private and public sector make her an invaluable member of the DTHF team. “Are you healthy?” Linda-Gail Bekker believes passionately in the right of every citizen to health and wellbeing. At the Desmond Tutu HIV Foundation she has brought together rigorous clinical research with community development. As an NPO the Foundation is able to raise funds to support outreach projects particularly those engaging youth. With a deep concern for the vulnerability of young people growing up in adverse situations, her vision is to create and sustain a centre of excellence for adolescent health and wellbeing.